So what do you think of when you hear the words ‘Paris, France’? You might say the Eiffel Tower, the Notre Dame, or maybe you’ll think of something more gastronomic like fine cheeses and delicate Bordeaux wines… I certainly think about all those things, but I also think of BIKES. Yes, I think of Parisians riding home from work with a bottle of red wine and a baguette under their arm, and of course the Tour de France! My wife and I recently spent just shy of two weeks in the City of Light, and let me just say, what a city! But beyond all the romantic Parisian experiences that we managed to enjoy, like walking along the Seine River, sitting under the Eiffel Tower, sipping café crème in little Brasseries that people like Hemingway or F. Scott Fitzgerald once frequented, and dining in some of the most incredible Paris restaurants, I wanted to see the real European cycling scene! I wanted to browse in incredible boutique bike shops, and oogle over the finest road racing machines Europe had to offer. I mean, after all, Paris and the Champs Élysées is where the Tour de France finishes up! This is a cycling Mecca, right?! 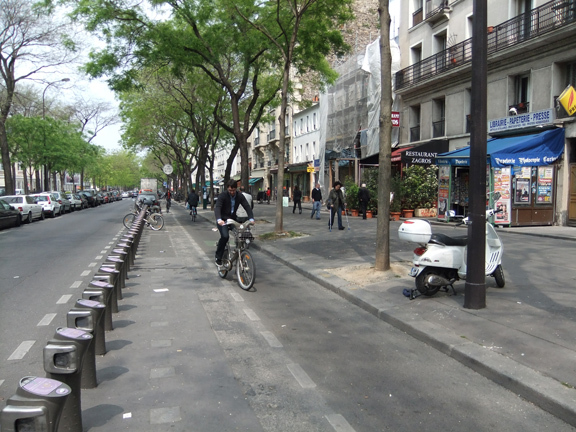 Yeah, well, maybe not so much… Paris is certainly a cycling-friendly city. It has an impressive bike lane system. Seriously impressive in fact. I had to try the Bike-Banks out. The 3 speed grip shifters were a nice touch I thought. They also have that great automated Rent-A-Bike system in place, and the coverage is nothing short of amazing. I kept an eye out for these ‘bike-banks’ and they were literally everywhere, and well used. 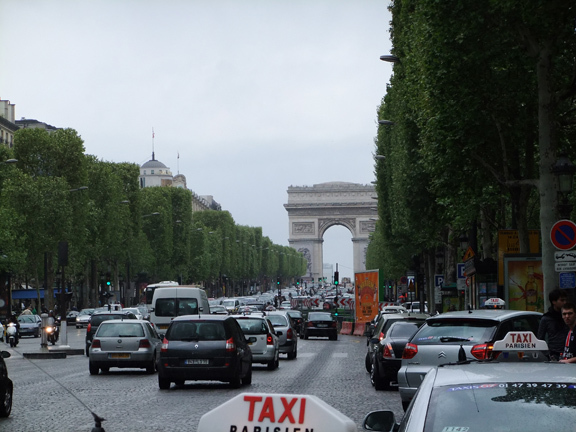 Bikes and cars in Paris live in a beautiful harmony. And something I found really quite refreshing is that all types of people used them: old, young, businessmen in suites, women in dresses, it didn’t seem to matter. No helmets though. I noticed that on the first day. Helmets don’t seem to have caught on there. Messes the do, I suppose. Beyond these bike-banks, there are lots of other bikes on the roads as well, and exactly the type you’d imagine. They are the upright vintage cruiser style, and from what I could find, these are the only reason any bike shops exist at all in central Paris. If you have lots and lots of bikes on the road, you’re going to need some bike shops around to repair them. Makes sense, well enough. But, to find no ‘new’ bike shops anywhere, was really pretty surprising to me. I could only assume that the bike shops I had in mind had to exist on the outskirts of Paris closer to the picturesque rolling roads of the French countryside. And, this was confirmed by a friend of ours, Richard, who oddly enough, we met on the 2009 Transrockies and then ran into while we were in Paris. Giselle, Kirsten, Me, and Richard at Les Deax Maggots. This was one of those truly super-strange ‘it’s a small world’ experiences. Richard saw on Facebook that I was going to be in Paris, and it just so happened, he and his fiancé Giselle (also a TR 2009 finisher) were going to be in Paris at the same time. 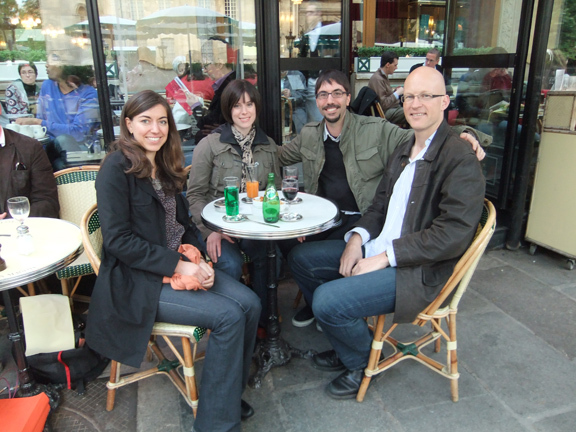 So, yeah, we all met up in Paris for drinks at Les Deux Maggots on the Blvd St. Germain des Prés, which was great. It really can be a small world. I am glad you enjoyed paris, it is a beautiful place indeed. I also noticed the lack of high end bike shops. although I managed to dig around the net and took the time to visit a store and was very disappointed by how small it was. I counted 16 bikes in total including 4 being repaired. Can’t believe you ran into Richard… A small world indeed!